Avast ye mateys! It’s Pirate Week in the virtual world There.com. This year’s theme Wenches VS Seadogs is a battle of sexes. We’re calling on all beauties and scallywags to set sheets to the wind and search for the hearty treasure. Are you pirate enough to make the crew? Wenches vs Seadogs starts Thursday, September 18th and the party will go on until we set sail for the high seas again on Wednesday, September 24th. Aye, me parrot concurs. Aye! We’re hankerin’ for a good ole time, and we know how t’ give it too, just take a peek at all these fantastic events planned for you, shiver me timbers! Description: Rescue the missing pirate crew and be entered for a chance to win an awesome prize! This is an event for pirate week wenches vs. seadogs! Description: A purported Spanish Pirate, the “last of the Buccaneers,” who is claimed to have raided the west coast of Florida during the late 18th and early 19th centuries. Sponsored by RumRunner’s Isle. Description: Wenches Vs Seadogs! Prizes given to each winner til the last Pirate or wench is standing alone and wins the grand prize. Dress in your best pirate outfit. Description: Wenches Vs Seadogs! Prizes given to each winner til the last Pirate or wench is standing alone and wins the grand prize. Dress in your best pirate outfit.All ye scallywags, the sails be set and the winds be fair forThareyWood. Thar be a few surprises tis evenin’. Cap’n Francis and First mate Kelly an’ crew o’squares lookin’ fer ye. 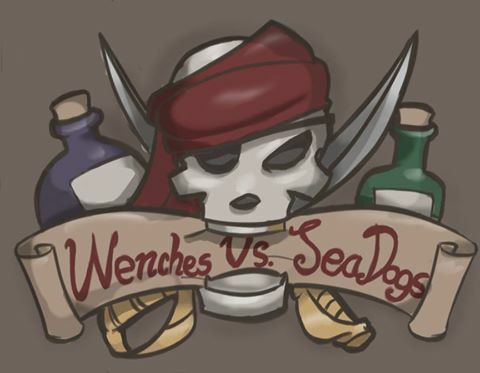 Description: Wenches vs. Seadogs. Undisclosed location. Guidelines given verbally at event. Pick up the most treasure to earn a spot on the CREW.